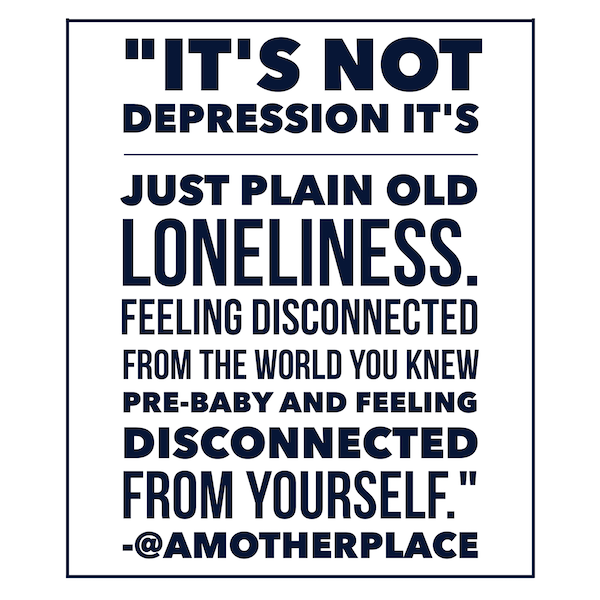 Nobody tells you about LONELINESS after having a baby. So let’s start to talk about it more in plain sight so it’s no longer dirty secret. It’s actually so obvious when you think about it isn’t it? You go from a busy professional and social life, being interested and being interesting (hopefully!) on a daily basis, interacting with other adults and having a structure to your day….and then you become a mother! Overnight, everything changes and suddenly you find yourself home, mostly alone, with your new baby. Yes your life has purpose and meaning and your baby becomes the centre of your universe, but it doesn’t always feel like the romantic picture you had in your mind. The days feel long and the plans you made don’t seem to fill them. Even if you are lucky enough to live near family and friends, they still have their own lives and you are on a different path to them at this time. Even if you live in a bustling town or capital city with baby groups fighting for your business, you can still feel so ALONE. You can even be sitting in the middle of a room full of mums and babies who look just like you and perhaps feel just like you, but they have their gang, they don’t notice you. So you return home with your gorgeous, much-wanted baby, that doesn’t yet give a whole lot back and you think you mustn’t grumble because this is what you signed up for right? But it’s not right and it’s not OK and we should all be doing something about it. (Especially if we have been through it ourselves). Today, why don’t you ask a mum if she is ok. Be brave and ask another mum for coffee (yes it’s cringe, it’s just like dating). Strike up a conversation in the nappy aisle in the supermarket. Include the mum who is on her own at Rhyme Time. Smile at the mum at the swings in the park. Knock on your mum-neighbours door and ask her if she fancies a walk. Text your friend or the friend-of-a-friend and ask her how she is doing. Go on…it feels good and it might make her day! SHARE THIS- SPREAD THE WORD- DO SOMETHING TO MAKE SOMEONE FEEL UN-LONELY! For more tips on the postnatal period, why don’t you check out our Online Antenatal Classes!